EPF Lausanne has the pleasure of announcing the launching of the book Les multiples vies de l’appartement-atelier. Le Corbusier at Les Presses Polytechniques et Universitaires Romandes (PPUR) in the series of the Cahiers du TSAM, the Laboratory of Techniques and Preservation of Modern Architecture. 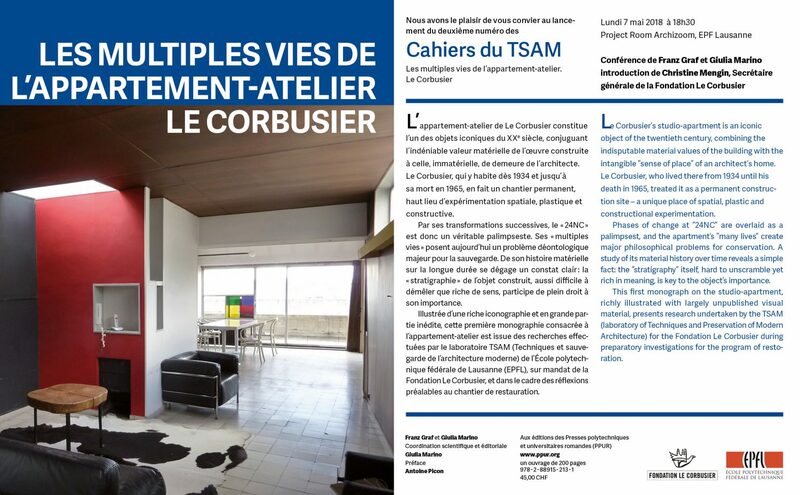 Published with the support of the Le Corbusier Foundation, this first monograph devoted to Le Corbusier’s atelier-apartment at 24, rue Nungesser-et-Coli in Paris traces the long-term history of this iconic object, a true palimpsest combining the material value of the work built with the immaterial value of the architect’s home. The launching conference will take place in EPF Lausanne, on 7 May, 18.30 PM.